It all began in 1938. * William and Ethel Johnstone built their home at number 71, second from the top in what was then called King Street. * Their daughter Nellie May (known as May) purchased land further down near the bend at 38 King Street. * Harold Johnstone, May's Uncle, purchased block 36 next door to May and block 75 next door to William and Ethel. * When May married fiance John Thiesfield later that year, they went ahead and built their home on block 38 and Uncle Harold gifted them block 36 as a wedding present. John and May moved into number 38 on Exhibition Wednesday public holiday. About that time Granite House had come up for sale. The asking price was 750 pounds. May asked her father for 300 pounds to put towards the purchase of the house but he said No. Their son Rodney was born in 1939. At the beginning of the war William and Ethel set up a Red Cross First Aid Station in the hall at the rear of Granite House, also called St Johns Wood House. They maintained it until the end of the war and then moved it to the front room their home at 71 Piddington Street. From there they gave all sorts of first aid services to the locals until it was closed in 1954 when Ethel died. After the war "Matey" Johnstone and her sister Olive Hamilton, who had retired as Matron of the Cunnamulla hospital, built a home on the corner block 75 Piddington Street. 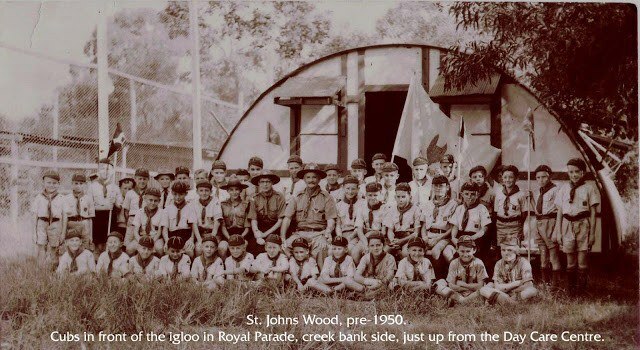 William “Pop” Johnston worked with E.A.Hawkins for Hawkins to gift land in perpetuity at 96 Buckingham Street to the Guiding Movement in 1947 with the Brownies and Girl Guides building a Hut and occupying it in 1954. William also arranged for a lease of land in Royal Parade from the Brisbane City Council and purchased an Army Quonset Hut (see image below) from the United States Army for the St John’s Wood Cubs after WWII . The Quonset Hut was later moved adjacent to the Boy Scouts in the old quarry but was lost in the 1974 flood. 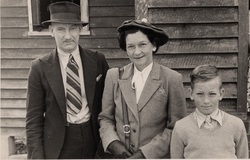 After Ethel died in 1954 William sold his home at number 71 and moved in with May and John down at number 38 for a time before moving into aged care. He died in 1959. He had been an early benefactor and well known and respected patron of St Johns Wood. 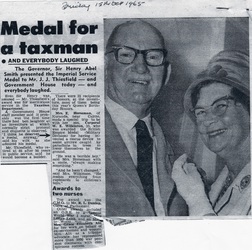 Olive Hamilton died in the early 1960s followed by Matey in 1964. Their property on the corner was left to May who gifted it to her son Rodney who had married Beth Sanderson in 1962. Rod and Beth moved into the old house on Exhibition Wednesday public holiday in 1964. In 1969 they moved the old house to Golden Beach where is still stands, and Rodney and Beth built their new home and raised their two daughters Nicole and Rachel. John Thiesfield had worked his way up in the tax office ultimately becoming a statistician. He was a keen tennis player and gifted artist. The attached pencil drawing of his wife May is easily mistaken for a photo. John died in early 1974. 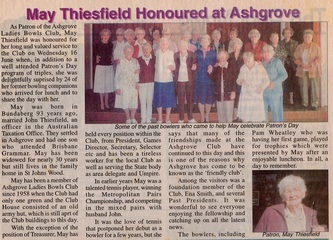 May lived on in her home until February 2005 when she went into aged care. 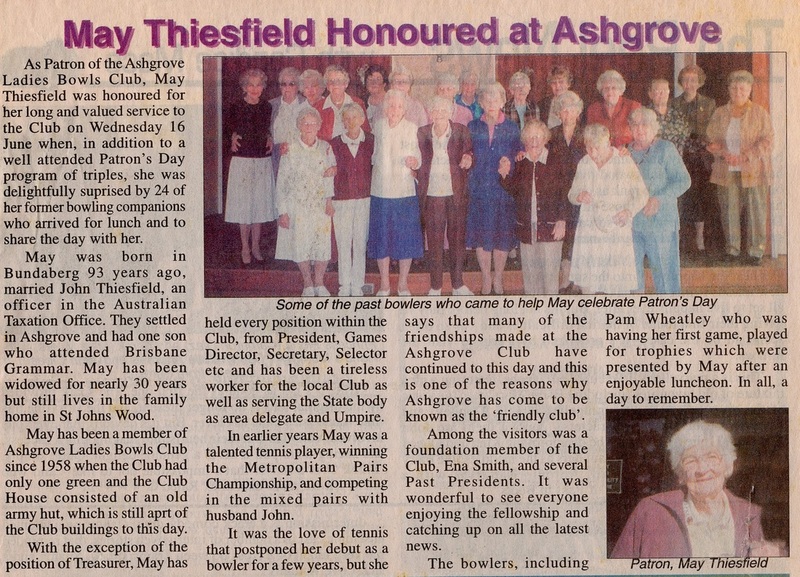 She had made her name as a stalwart and ultimately Patron of the Ashgrove Ladies Bowls Club. She was a familiar sight in Piddington Street dressed in her white bowls uniform. When visited by her great grandchildren from grand daughter Nicole, May christened them the 5th generation in Piddington Street. May died in July 2005. Grand daughter Rachel moved into 38 Piddington Street at Easter 2005. Her son Elijah was born in 2008 to become the 5th generation to live in the street and likely be the 3rd generation to attend Ashgrove School.